The presenter writes down a prediction. He takes out a few chips from his pocket and there are ESP symbols that can be seen on both sides. Then he asks the spectator to build up a tower from these chips by placing them on top of each other. The ESP symbols on the top and on the bottom of the tower are identical with the ones written down as the prediction. Of course the trick can be repeated many times. 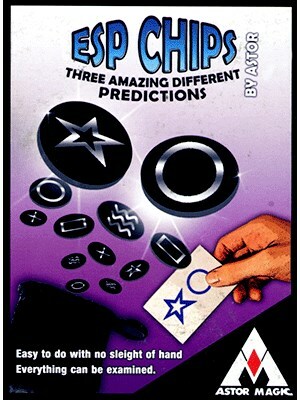 The prediction will be different each time, furthermore even the spectator can predict the result after putting all chips in his pocket. He has to take out the chips from his pocket one by one except from the last one. Now the spectator builds the tower from the chips. The ESP symbols on the top and on the bottom of the tower will be matching with the symbols on the chip remaining in his pocket. This trick can be learned easily and even can be presented in different ways many times. Includes 10 ESP chips, bag and instruction sheet.